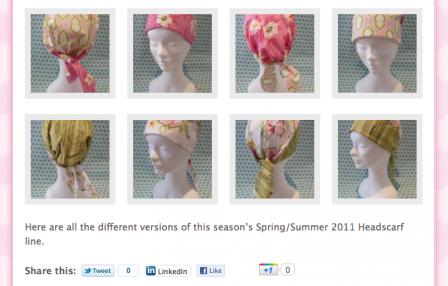 You may have seen the new +1 buttons appearing across the web but do you know what they are? 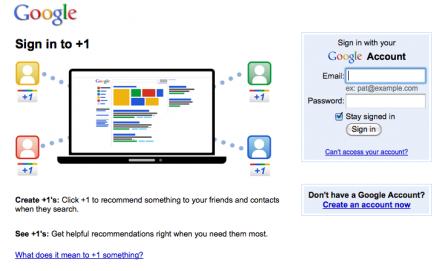 The +1 button started appearing on Google search results and adverts back in March 2011 encouraging users to recommend content to friends and contacts. This month Google released the +1 button to the whole web so that it can be used on any web page. Google describe the button as shorthand for “you should check this out”. To +1 something just click on the +1 button. You need a public Google profile to help people see who made the recommendation. If you are not already logged into your Google account you will be asked to sign in. A new tab in your Google profile stores your + 1′s which you can keep private or share with the rest of the world. We’ve started to add Google +1 buttons to our ‘Share this’ tool bars. thepompomproject.com was the first of our clients sites to benefit. 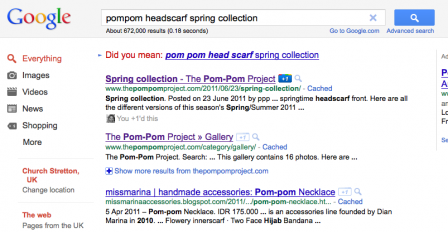 If you search for pompom headscarf spring collection you will find that I have +1′d the page and it is highlighted in the Google search results. We’re just getting used to the phrases ‘Like’ and ‘Tweet’ now you’ll be asking friends if they have +1′d a page. This entry was posted in Social media and tagged +1, google, share-this, social-media. Bookmark the permalink. ← We’ve had a make-over!